Energized by labor protests by black workers elsewhere in the South, the strikers refused to yield until administrators met demands for increased wages and better working conditions. 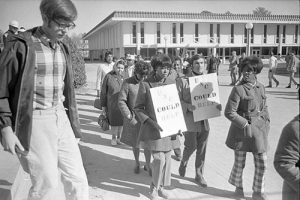 The food workers’ efforts in 1969 drew attention to the plight of the University’s service employees, a concern that continues to spark discussion today. For hours, directions, and parking, see Wilson Library’s visit us page. For information on previous exhibitions, see our past exhibitions page.